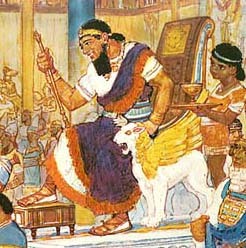 Solomon on his throne meeting the Queen of Sheba, by Henry J. Soulen appears in Everyday Life in Bible Times (National Geographical Society, 1967) pp. 230-231. Henry J. Soulen's painting of Solomon on his throne meeting the Queen of Sheba shows winged lions (cherubim?) on either side of the throne. The painting was originally published in a National Geographic Magazine in the 50s in an article by Old Testament archeologist G. Ernest Wright, and no doubt reflects Wright's understanding of what such a throne would have looked like. Wright was the leading OT archeologist of his day, and a professor at Harvard Divinity School. It is based on a description of Solomon's throne found in 1 Kings 10:18-20, which appears to be patterned after a phoenician prototype. When I saw Soulen's picture in the light of the cherubim on either side of the ark of the covenant, something clicked. Though it is difficult to absolutely prove from Bible data, I believe it is very likely that the ark of the covenant is the portable throne of God, the place the High Priest met God, between the cherubim over the "mercy seat". Canaanite nobleman or prince sitting in sphinx-chair. This scene is drawn from an ivory carving found at the Canaanite stronghold of Megiddo. It appears in Readers'Digest Great People of the Bible and How They Lives (Readers'Digest Association, 1974), p. 100. French Old Testament scholar Ronald de Vaux, in Ancient Israel (McGraw Hill, 1955, p. 300), concludes, "... it seems probable that the Ark and the Cherubim represented the throne of God in the sancturaries of Shiloh and Jerusalem...."
A number of texts praise the Lord of Hosts who is "enthroned upon the cherubim"(1 Sam 4:4; 2 Sam 6:2; 2 Kings 19:15; etc.) Lotz, Kyle, and Amerding, "Ark of the Covenant,"in ISBE 1:293-294 discuss various theories of the significance of the ark, and conclude that while the throne idea may be present in some texts, clearly the ark was built to embody the presence of God among His people. From my own standpoint, I see the ark as the figurative throne of God in the midst of his people, placed in the inner chamber, etc. Throne of Tutankhamen found in his tomb (1361-1352 BC). Made of wood, it is overlaid with sheet gold, inlaid with precious stones, and ornamented with animal shapes such as winged cobras wearing the crowns of Upper and Lower Egypt. It is fround in the Metropolitan Museum of Art, photo by Egyptian Expedition. In ISBE 4:845. Ahiram, king of Byblos, seated on a cherub throne, before an offering table, from the National Museum, Beirut. ANEP 458. Appears as plate 126 in James B. Pritchard (ed. ), The Ancient Near East: An Anthology of Texts and Pictures (Princeton University Press, 1958).